Well, got it up. Probably a few corners cut, but if it didn’t go up now not sure when I’d get it up. Hopefully the stars will align for a onto Thursday update now. It seems that whomever is behind their troubles, they don’t seem interested in a stabbing contest. A vaguely similar bit of magic Kally used to toss a pile of rocks. Well, that quickly blew up in her face. It really makes you question the wisdom in their fairly uniform lack of helmets. But will it make her more or less careful be to smacked in the head? Who knows. At least she’s got eye protection. I have to wonder if the specs she’s wearing are some sort of combat HUD glasses or if they’re even removable. My first impression was that she has cybernetic eyes or something. It could be like Geordi La Forge’s. if you look closely in 2, 4 and 5 there is a … magic circle? whatever, its white so its a bit hard to make out the details. i was thinking the one in 4 was hers, but now i am less certain, as you see several in 2 preparing to launch? the pile of scrap. in panel 5 you get a circle near her gun, like most others weve seen, and then something is disrupted. also she gets a nice pink sparkly effect, maybe some sort of shield or byproduct of feeding magic to her gun. and again, if your attacking a building that may or may not have experimental military weapons, weither they are legal or not, do not expect the security to be regular run of the mill rent-a-cops. especcaly if its illegal resarch. ex military might cost more, but can be oh so effective. as this trap seems to have been pretty decent. You’re correct in that the only magic circle generated by her is in panel 5; and the others are sort of hard to spot 😉 In panel 2 someone picks the pile of rubble up, in panel 4 they fling the rubble outside. The way it looks to me, in Panel 3, the floor is collapsing under her in a mechanical (rather than magical) trap. In Panel 4 she is beginning the forward flip that will enable her to avoid damage. 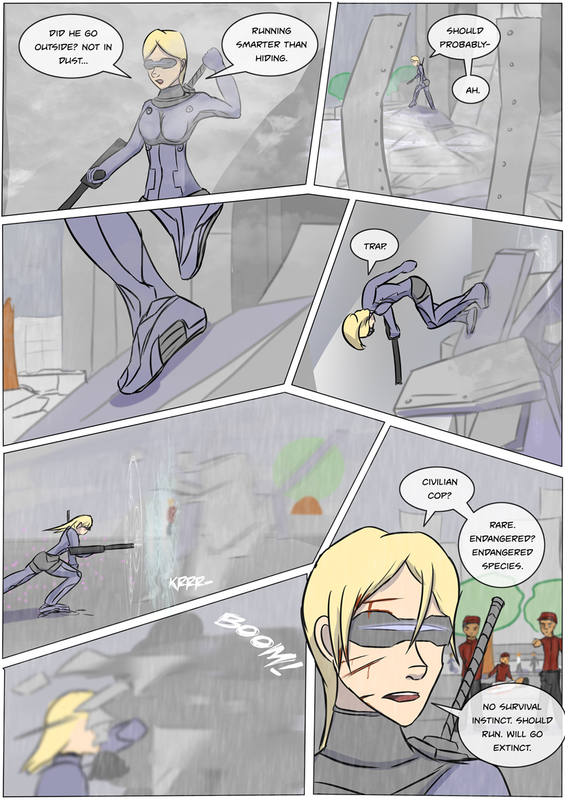 In Panels 5 & 6, she is outside in the rain, and it’s probable that she landed there since she seems to have blasted a hole in that obstruction in order to get back in (to the detriment of her face). In Panel 7, the Rent-A-Cops have shown up behind her. There’s something about this page that makes it difficult for me to follow what is happening. In panel 4, it looks like she is walking almost vertically on a broken piece of wall. Is gravity being manipulated? In panel 5, we see her take up a position and shoot her gun. And I’m not sure whether she intended to shoot the barrier/portal or if the portal immediately popped up in front of her. Panel 7 makes it look like she is outside the building now. I’ll have to talk to our scene designer about clarity of action flows… 😛 I agree, it’s not super clear. Essentially the pile of rubble she was walking over gets lifted up and tossed outside, presumably aiming for her to end up under it. But it’s been awhile sense we had action scenes. I suspect there are a lot coming up, so I’ll have plenty of time to work on getting them to flow better. My normal inclination to is to rely on more wide panning shots, but unfortunately each of those take a lot of time and comic real-estate, so it’s something of balance. How she speaks is sort of modeled after I find that I speak foreign languages – she knows plenty of grammar (though sometimes oddly applied words), but can’t really form full sentences and lacks particularly conjugation or grammar (… some would say that’s how I speak English too sometimes… 😉 ). To be honest she didn’t originally have a lot of speech on these pages, so I didn’t give huge plan to how she spoke the default language in the planning phase. She’s not a POV character, so I didn’t want to have translated dialogue when no one was there that would understand it. I dunno, probably one of those things that only makes sense to me 😛 Still the page seemed a little empty without the dialogue, so I added some in. I think it’d make her dialog flow better for her to speak broken Malsan when she’s with her team, while speaking her own language when she’s talking to herself. Most webcomics I’m familiar with insert foreign language dialog in [less than] and [greater than], treating them like brackets. I thought her dialog on this page was a little comical. That’s not necessarily a bad thing, though. She’s a real people person. I reckon she puts interpersonal skills near the top of her resume. I believe it’s because she got them confused with antipersonal skills though.